Our first winter in Toronto did not start the way we expected. We discovered very quickly that the York University campus, where we were living, had the apt nickname, “Siberia,” and that we had exchanged the damp but relatively gentle winds of Victoria for the bone-chilling, driving sub-zero blast of what we were beginning to think of as a flat urban wasteland. Did things improve? Did we finally get that beautiful Ontario snow we were expecting? 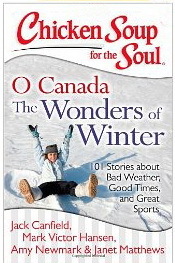 Well, you’ll have to read my story in the new collection, Chicken Soup for the Soul: O Canada The Wonders of Winter: 101 Stories about Bad Weather, Good Times, and Great Sports. But seriously, Craig and I ended up having many wonderful winter experiences over our four years of living in Ontario (including snow-shoeing over pristine snow north of the city, seeing my first Snowy Owl and Snow Buntings on an outdoor education field trip, and gazing down at the frozen Niagara Falls as we crossed the bridge to the US to watch a hockey game in Buffalo). By our second winter, we had a car, and two of our good friends, Mark and Donna, had moved from the westcoast to Hamilton (an hour’s drive from Toronto), and on weekends we explored a lot of the countryside together. Craig and Mark were on a constant quest to find the best pond on which to play ice hockey. In warm weather, they scouted for accessible ponds with potential. When the temperature started to cool, they monitored the thickening ice. The moment the ice could hold their weight, they were out skating and passing a puck around (long before locals were ready to brave the ice). Donna and I skated too, but we never lasted as long as Craig and Mark. When I saw the call for submissions to a Canadian winter themed Chicken Soup for the Soul, I knew I had to write something about our Ontario experience and the siren call of frozen ice. But which of our many winter memories should I pick? 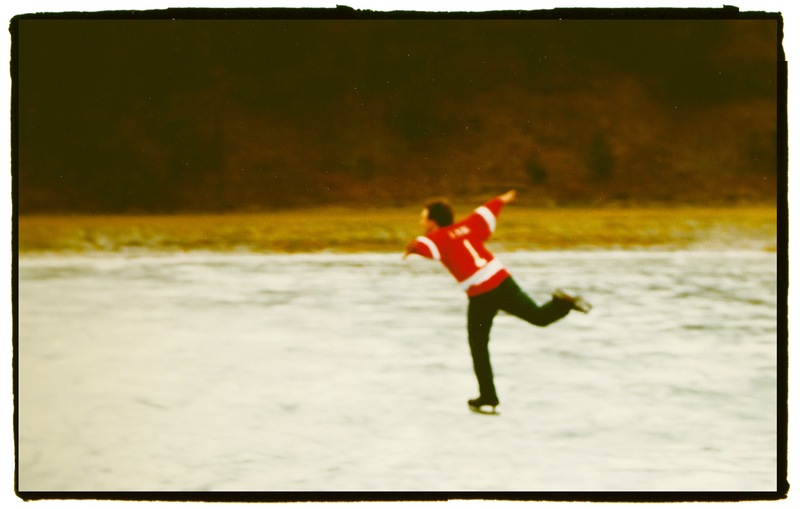 Should I write about the Christmas day we tested the ice on a pond in the middle of a deserted conservation area? Or the night we skated on an old outdoor rink ─with boards around the outside and lights overhead, canned music, and a warm-up hut with a wood stove? Or should I write about the time we were house and dog-sitting on a farm north of the city, and we skated on the farm pond as the two big dogs slipped and skidded around us? No. I decided to start at the beginning ─with the first winter and the first pond.